Herbs, terrestrial, small to medium sized, slightly robust, to 75 cm tall, evergreen. 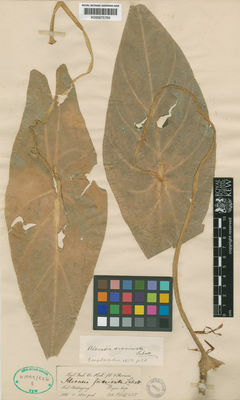 Stem rhizomatous, generally elongate, erect, later decumbent, 8–75 × 2–6cm. Leaves to 5 together, subtended by lanceolate papery-membranous cataphylls; petiole bright green, 15–80 cm, glabrous, sheathing in proximal 1/4; leaf blade spreading, bright green, narrowly hastate-sagittate to ovate-hastate, 15–60 × 8–20cm; posterior lobes 1/4–1/3 length of anterior, peltate for 25–30% of their length, acute; anterior lobe with 3–6 primary lateral veins on each side, axillary glands hardly conspicuous, interprimary collective veins weakly defined. Inflorescences usually solitary; peduncle green, 9–20cm, subtended by cataphylls. Spathe 7–10cm, moderately constricted 1.5–2.5cm from base; proximal spathe green, ovoid; limb pale green, lanceolate, canoe-shaped, 5.5–7.5cm. Spadix subequaling spathe, 6–9.5cm, sessile; female zone 1–1.5cm; pistil green, subglobose, 1.5–2mm in diam. ; stigma white, sub-sessile, very slightly lobed; sterile zone 7–10mm, narrower than fertile zones; synandrodes narrowly rhombic-hexagonal, flat-topped; male zone ivory, subcylindric, 1.2–2.5cm × 4.5–8mm; synandria 4–6-merous, ± hexagonal, ca. 2mm in diam. ; appendix white, 2.5–3.5cm, demarcated from male zone by a strong constriction, narrowly conic. Fruiting spathe green, ovoid, 3–4cm. Fruit ripening orange-red, globose-ellipsoid, ca. 0.75cm in diam. Everwet to seasonal perhumid evergreen forests, usually in deep shade, less often on track sides.